Property Size : 4000 sq. ft.
Property Size : 2200 sq. ft.
Property Size : 2600 sq. ft. Stylish property sitting on 12 acres and 1000 ft of water front, offering complete privacy. 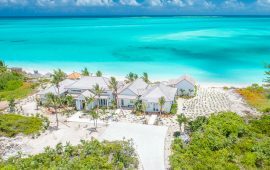 Located on clear turquoise waters overlooking unspoiled beaches of Moriah Harbour Cay National Park. 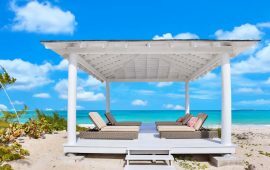 Property Size : 4,500 sq. ft. 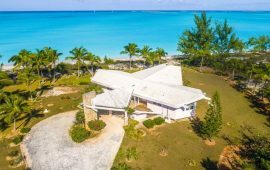 Private beach house with 150ft of beach front and private dock on tranquil Hoopers Bay. 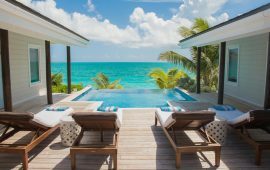 Spacious beach house on a virtually private beach overlooking the Atlantic Ocean. Away from it all! 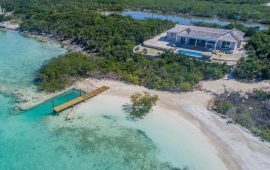 Simple yet very welcoming water front home on the quiet souther side of Great Exuma. Property Size : 3360 sq. 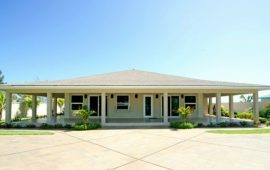 ft.
Beautiful beach front home with wrap-around deck and expansive pool area overlooking a beautiful quiet white sand beach. 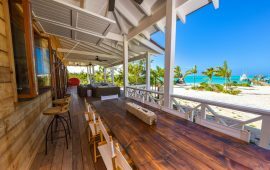 Uniquely designed as a Tahitian village, this Stunning home overlooks a gorgeous, quiet beach. Property Size : 3000 sq. ft. 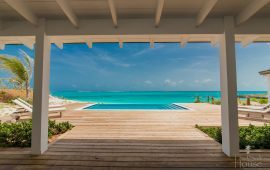 Newly constructed home with an astonishing view of Moriah Harbour, a beautiful pool, beach and private boat dock. Property Size : 3100 sq. ft.